The Q&A with Coach Phil Martelli. He seems to get infatuated with specific teams for some reason, sing their praises every chance he gets while ignoring others. If memory serves he spent an inordinate amount of time on VCU and URI last year, of course that's going completely off memory, which is spotty. THE SKINNY: This could be Shaka Smart’s most complete team. THE SKINNY: The Billikens return a starting five that is a good enough to win the conference for the second consecutive year. THE SKINNY: Don’t be surprised if Tyrone Garland leads the Atlantic 10 in scoring. THE SKINNY: The back court of Chaz Williams and Derrick Gordon will be must-see TV. THE SKINNY: Archie Miller’s squad has all the requisites to make a jump. THE SKINNY: The Rams will win 20 games. Book it. THE SKINNY: Hawks will have plenty of talent, but what about the chemistry? THE SKINNY: The addition of Indiana transfer Maurice Creek gives Mike Lonergan a formidable starting five. THE SKINNY: Paul Hewitt’s team has the size and depth to adjust quickly to Atlantic 10 play. THE SKINNY: Chris Mooney returns three of his top four scorers, but who replaces Darien Brothers? THE SKINNY: Freshman guard Jon Severe is the Rams’ most fabled recruit in a quarter century. THE SKINNY: Jim Ferry is quietly building a capable Atlantic 10 program. THE SKINNY: Andrew Nicholson is not walking through that door. The Hawk's version of hell? Multiple overtimes because he must keep flapping. 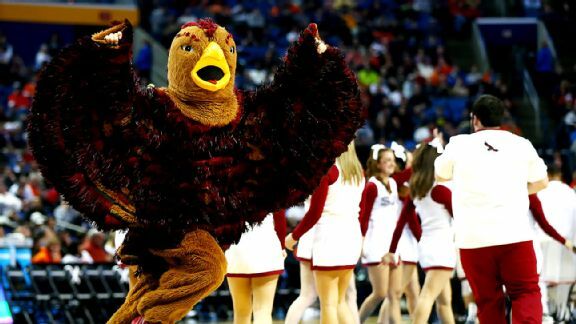 We applaud both his durability and ability to meld the iconic fan chant -- "The Hawk will never die" -- with a bird costume. 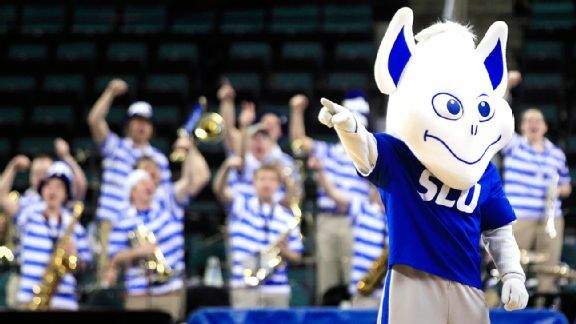 If the creators of "Monsters, Inc." really wanted to come up with a critter that would haunt children's dreams, they would have included the Billiken. He's so utterly terrifying that he's amusing. If Marshall Henderson's antics grew tiresome for you last season and you needed a new conscience-free gunner to support, you could have done worse than Jon Severe of Fordham. Severe's freshman season was literally built brick by brick. While he averaged 17.3 PPG to rank fourth in the A-10, he did it by hoisting nearly 16 shots per game and shooting a hideous 33.1 percent from the floor. Consistency was a mere rumor. Severe wasn't even the Rams' leading scorer, but teammate Branden Frazier (18.2 PPG) has graduated, leaving Severe as the top returnee. Improved shot selection has been a buzzword all summer, which could see Severe push into the 20-PPG range even with fewer looks. I don't think Severe will lead the conference in scoring. The additions of Eric Paschall and Nemanja Zarcovic will be the main reasons why. I see Severe's PPG staying about the same and his assists per game going up. I'll be pretty disappointed if Severe is shackled a bit. He's a peacock, Captain. You gotta let him fly. Well I sure hope you are disappointed b/c your being entertained is not high on my lists of priorities when it comes to what I want from Fordham basketball. I expect Kendall Anthony to lead the A-10 in scoring, but not to lead our team in scoring. The Athletic Department has arranged for our Math & Physics students to collaborate on how best to achieve this. This is easy, just need someone to score tons in the OOC and then get injured before or shortly into the conference seasons. Ranking anything these days guarantees a debate. Over the past couple days, we ranked the top players and coaches in the Atlantic 10. Today, we take a shot at ranking the best arenas and fan bases in the conference. While not the newest or most advanced facility in the league, UD Arena which opened in 1969 is still the best place to see a game in the A10. With great fans and atmosphere every single game (averaged 12K plus fans) there's no question why the NCAA places its opening round games in Dayton every year. Dayton is 563-211 all time at UD Area. Like Fenway Park or Madison Square Garden, UD Arena is a must-see venue. The nostalgia is ever-present inside the building and Flyers fans are as loyal as they come. Not as historic as UD Arena or as impressive as Chaifetz, the Siegel Center is simply a raucous band box where VCU hammers opponents (193-29). “The Stu” ranks 11th in the nation in home court advantage according to rpiratings.com, where VCU has beaten 86.9% of all opponents since opening its doors in 1999. After receiving a $43 million face-lift starting in 2008, the Smith Center has become a fantastic place to catch a game. Opened in 1975, the Smith Center holds 5,000 fans and now has amenities to spare. The Colonials have won just a tick under 70% of their contests all-time. Opened in 2002, the Ryan Center often flies under the radar when discussions turn to great facilities. URI can cram over 7,600 fans inside the gorgeous $54 million building which has a high major feel all the way through. Its recent upgrades include a new floor and digital banners. As the Rams keep improving their building will get additional traffic and acclaim from fans who visit the Ocean State. Not much argument here. Dayton lives and breathes basketball and the energy in UD Arena takes a backseat to no other venue. The other venues are solid in their own right for various reasons and perhaps only the Reilly Center (St. Bonaventure) or Hagan Arena (Saint Joseph's) could be swapped into this list in place of the Charles E. Smith Center. No fan base even comes close to VCU's in terms of energy, volume and passion. In the past two years at the Barclay’s Center seeing their fans and band alone have been worth the price of admission. During VCU's blowout wins (which they're many) you'll find yourself just waiting for their bands' next set during the media timeouts. VCU’s fans truly feed off their team’s “Havoc” style in the seats. Spike Lee travels to see them play regularly, so you know they bring the heat. Before the Rams arrived in the league, Dayton fans topped this list. While no longer number one, UD fans still travel just as well and show up at arenas all over the country, especially during March. Their fight song is not only tremendous but it will reside your head long into the spring. Technically a fan, Rudy Flyer, is likely the league's best mascot. Despite being the smallest school in the league, no fan base packs as much punch as Bonnies’. They have as passionate a fan-base as you will find despite not having the funding for a pep band (they thank Dayton for playing in their stead last March).Last year, in the league semi-final against Saint Joseph’s, Bonnies fans traveled three times as far and dominated the arena despite losing on the hardwood. No matter where the Bonnies play, there always seem to be an alumni presence that defies logic given their incredibly small alumni base. Much like Dayton fans, SLU fans have made a habit of traveling all the way to Brooklyn to watch their team play. Their Midwest-base fans are friendly and knowledgeable and have been a great addition to the league since their arrival. It will be interesting to see if this fan presence decreases this March in New York if the Billikens are not a top 25 team. While Mason’s play on the floor last year was anything but pretty, their fans are still top-notch. Their home games were swell attended averaging nearly 5,000 despite a horrific season (11-20). That is a true sign of a diehard fan-base. Expect Mason Nation to make a bigger splash this year at the Barclay’s Center if their squad has a respectable season. Mason Nation does still exists—the A10 just hasn't seen it full throttle yet. Here's to hoping that happens next winter. Fueled by outstanding commitment from its administration (and on game days by one helluva band) the VCU fan base has developed a gigantic presence and definitely has the most reach and resonance of A10 schools in recent years... whether traditionally, across social media platforms, etc. -- but Dayton's fans have withstood the test of time. Whether the Flyers are winning consistently or struggling, the place is filled. That's telling. Neither fan base deserves to be number two here. Not even 40 yet, Smart has a .749 career winning percentage (136-46) and a Final Four under his belt. The second youngest coach to reach 100 wins, Smart is more than a head coach but almost an iconic figure in college basketball for his electric personality and up-tempo coaching style. While Smart signed an eight-year extension to stay at VCU back in 2011, his name will likely be front and center for high profile jobs at Duke and North Carolina as soon as they open up. Smart is one of the most recognizable faces in college basketball today and has elevated VCU into a national brand and recruiting powerhouse despite not playing in a high major conference. With a 55-14 record over two years at SLU, Crews has racked up several accolades (NABC Coach of the Year, Sporting News Coach of the Year and back-to-back A10 Coach of the Year Awards) since taking over at SLU following Rick Majerus’s untimely passing. His poor seven-year stint at Army is about the only blemish on his resume—in Crews' defense Army doesn't exactly have a winning tradition. Crews has been named his league’s Coach of the Year a total of six times. The 2014-2015 season will test Crews tremendously as the Billikens graduated almost all of their major talent. Miller vaults up this list following UD’s run to the Elite Eight last year (26-11). His three-year coaching record is a stout 63-38 and the 35-year-old Miller seems to be developing as a head coach each year. Last summer, Miller was nowhere close to top five, but his run in March turned heads. He can strengthen his place here by improving his record in A10 play where his Flyers have hit just a few games over .500 since he took over from Brian Gregory. No one gets more out of his team each season than Chris Mooney who has a record of 166-132 at Richmond over nine seasons. A tremendous basketball mind and developer of players within his system, the only knock on Mooney is his club hasn't won 20 games since Justin Harper and Kevin Anderson left town following the 2011 season (29-8, Sweet 16). Mooney’s team hasn’t finished higher than seventh since 2011 but we expect that to change this year as the Spiders have seemingly improved. Martelli bought himself a ton of equity with Hawk fans after their A10 Tournament Championship last year following back-to-back NIT appearances. After losing three stars, this year will really showcase Martelli’s coaching ability. St. Bonaventure's Mark Schmidt could easily crack this list for his ability to elevate his roster each and every year but we will give the Bald Eagle the slightest of edges here coming off a championship. The Atlantic 10 is a league full of great coaches and it's tough to argue with any of Ian's selections in Smart, Crews, Miller, Mooney and Martelli. I'm not sure about Miller among the league's elite just yet, but when you take your team to an Elite 8 I'm also not sure it matters what some bald guy in Rhode Island thinks. That said, Bob McKillop, though a new face, is one of the best coaches you'll find. He'll have his work cut out for him as Davidson enters new competitive territory, but the man can coach. Mark Schmidt also does wonders up at Bonaventure. Mike Lonergan has been outstanding at GW... the list goes on. Bottom line: there is an excellent coaching contingent woven throughout in the A10. Pick 5 and go with 'em. Just about any mix is defensible. Like Fenway Park or Madison Square Garden, UD Arena is a must-see venue. However i think DiSano said it best, the A10 is full of good coaches. ST. LOUIS — St. Louis Sports Commission president Frank Viverito is hopeful after meeting with NCAA officials about the city's bid to host an upcoming men's basketball Final Four. The St. Louis Post-Dispatch reports that six NCAA officials have visited St. Louis. Viverito told the newspaper he felt good about the way it went. Eight finalists are competing for NCAA Final Four sites for 2017 through 2020. St. Louis is probably an underdog considering that the other cities have new stadiums. They are Indianapolis, Atlanta, New Orleans, Minnesota, Dallas, San Antonio and Phoenix.